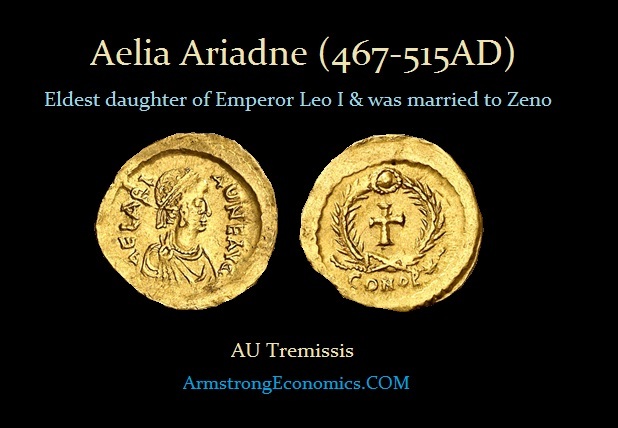 Aelia Ariadne was the eldest daughter of Emperor Leo I and Verina. In 467, the alliance of Leo needed the support of his military guard led by Tarasicodissa. To seal the alliance, he then gave his daughter Ariadne in marriage. Because he was effectively a barbarian in origin, to make himself more acceptable to the primarily Greek-speaking population of Constantinople, he changed his name to Zeno. Their only known son became Leo II, who was born within the year. Leo II was proclaimed Caesar in October 473 and became the designated heir to the throne. On January 18th, 474, Leo I died of dysentery and Leo II immediately succeeded him. However, Leo II was still far too young to rule himself. His mother Ariadne and his grand-mother Verina instructed him to crown Zeno as co-emperor, which took place on February 9th, 474AD. Leo then became ill and died on November 17th and Zeno thus became sole emperor, with Ariadne as empress. Because of Zeno’s barbarian origins, the people distrusted. The strong Germanic portion of the military, led by Theodoric Strabo, disliked him and his Isaurian officers. Meanwhile, Verina conspired against her daughter Ariadne and Zeno with here brother Basiliscus. In 475, a popular revolt against the emperor began and the Germans, led by Theodoric Strabo, Illus and Armatus, combined to seize control of Constantinople. Verina convinced Zeno to leave the city, which he did taking many of the Isaurians living in Constantinople with him. He also took the imperial treasury. Basiliscus was then acclaimed as Emperor on the 9th of January, 475AD. However, Basiliscus then conflicted with Verina and had her lover executed to prevent her from trying to raise him to the throne. Thus, Verina now plotted against later intrigued against Basiliscus who also supported a massacre of all the Isaurians still living in Constantinople. As his support then declined, Zeno marched on Constantinople for vengeance and he was joined by the leader of the Pannonian Goths, Theodoric the Amal (later known as Theodoric the Great). Theodoric would have attacked Basiliscus and his Thracian Goth foederati led by Theodoric Strabo. Constantinople was defenseless and the Senate opened the gates of the city to the Isaurian, allowing the deposed emperor to resume the throne. Ariadne was still his Empress consort. In 479, Ariadne came into conflict with her husband over the fate of her mother. Verina had attempted to assassinate Illus and had become his prisoner. She had supported the revolt of her other son-on-law Marcian even during her captivity. Ariadne endeavoured to obtain her release, first from Zeno, and then from Illus, to whom the emperor referred her. Illus not only refused her request, but charged her with wishing to place another person on her husband’s throne. This irritated her; and she, like her mother, attempted to assassinate Illus. The assassin whom she employed failed to kill Illus, but cut off his ear in the attempt. The assassin was taken, and Zeno, who appears to have been privy to the affair, was unable to prevent his execution. Strangely, Ariadne remained married to Zeno until his death on April 9th, 491AD. 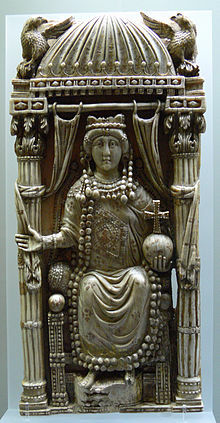 The widowed Augusta was able to choose his successor to the throne and a second husband for herself in the person of Anastasius, a palace official. Anastasius was proclaimed Emperor on April 11th and they were married on May 20th, 491AD. She died in Constantinople in 515AD and was buried in the Church of the Holy Apostles. Anastasius was buried beside her in 518AD.